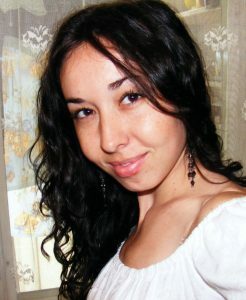 Born in 1983, Braila, Romania. I’m an emerging artist based in Bucharest, Romania, working in oil, watercolor, acrylic and mixed media. I often experiment with a variety of tools and unconventional materials like plastic bags or textiles. Materiality of the artistic image is part of my research, both theoretically and practically. Having an academic training in art restoration, I learned the essential art traditions and methods, while still maintaining creative exploration. The human figure is the major inspiration of my work. I am interested in how society, history and time have shaped the human being. I like to work in series in order to be able to explore a particular theme, concept or composition. My latest research is about metaphysical expressionism. “White Shadows” series is inspired by Giorgio de Chirico’s art of metaphysics and sometimes by the Romanian culture in expressionist lyricism. Starting from the idea that a shadow signifies presence and absence in the same time, I try to depict the passing and always present human nature, souls on a stage that are incessantly floating with their white unnatural shadows, deployed by the space they manifest into. My work is part of several collections in Europe and America. 2017 Biennale dei Castelli della Gera d’Adda, Bergamo, Italy. 2014, 2015 Spoleto Festival Art, Italy. 2011 Din paleta Bucurestiului at The House of Parliament, Bucharest, Romania. 2008 National Art Centre Tinerimea Română, Bucharest.